Sunday 7 October, Lotto Soudal will line up at the autumn classic Paris – Tours, which this year also includes some gravel roads. The final 60 kilometres feature seven ascents and 12.5 kilometres of French vineyard tracks. This way, the organisation wants to intensify the battle between the sprinters and attackers even more. The renewed edition starts in Chartres and finishes after 214.5 kilometres in Tours, where the successor of Matteo Trentin will be rewarded. Jelle Wallays, recent stage winner in the Vuelta, was able to win this 1.HC race in 2014, when he beat Thomas Voeckler in a two-man sprint. For Lotto Soudal, the race's 112th edition will be a special one: not only because of the new route, but also because Paris – Tours will be the last race of Jens Debusschere and André Greipel at Lotto Soudal. 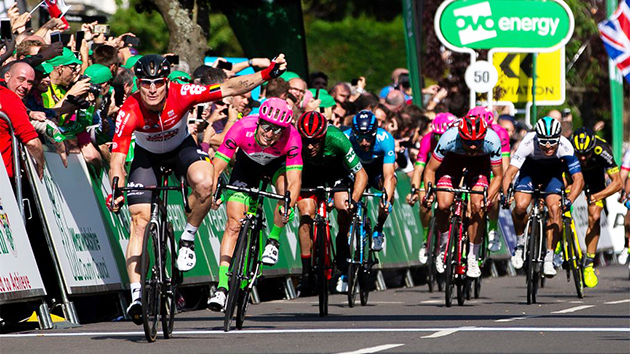 André Greipel wins stage four of the 2018 Tour of Britain. Paris-Tours will be his last race in a Lotto-Soudal kit. Line-up Lotto Soudal: Tiesj Benoot, Jens Debusschere, Frederik Frison, André Greipel, Jens Keukeleire, Nikolas Maes and Jelle Wallays. All three riders are part of Ralph Denk’s team since its very beginning back in 2010. While Benedetti extends his contract until the end of 2020, Schwarzmann and Schillinger renew their agreement for another year. Cesare Benedetti will be in Bora-hansgrohe colors for a while. Egan Bernal has signed a new five year deal with Team Sky, extending his current contract until the end of the 2023 season. Bernal , 21, has enjoyed a meteoric rise up the cycling ladder in his first year with Team Sky, emerging as one of the brightest young talents in the sport. After winning the Colombia Oro y Paz and the Tour of California earlier in the year, he made his Tour de France debut in July, playing a key role in Geraint Thomas’ maillot jaune success. Now, having signed a long-term deal with Team Sky, the talented climber is looking towards an even brighter future with the team. “I’m very happy to sign a new contract with Team Sky,” he said. “It feels like a new stage in my life. I know five years is a long time and that it’s not too common in cycling, but the team has been great for me. They offer me everything I could want and I’m excited about the future. “I imagined my first year with the team would be different and I was nervous before I joined. But I found great people, a team that was ready to help me, and I enjoyed a good season. It was made easy for me. My ambition is to keep developing as a rider – to learn from and help the best and become a key member of the team for many years to come. For me there is no better place to do that than Team Sky. Team Principal Sir Dave Brailsford welcomed the news of Bernal’s new deal, commenting: “This is an important moment in the development of the team. A five-year deal in cycling is exceptional, but Egan is an exceptional talent. I believe today’s announcement demonstrates three things. “Firstly, it is the clearest signal of our belief in Egan as a rider, with the potential to win the biggest races in the world in the coming years. Age is no barrier to ability. Egan is part of the next generation at Team Sky, our next big leader for Grand Tours in the years to come, as we continue to build for a bigger and better future. He is a top talent who has already shown his mental and physical strength in recent months. He will only keep on improving. 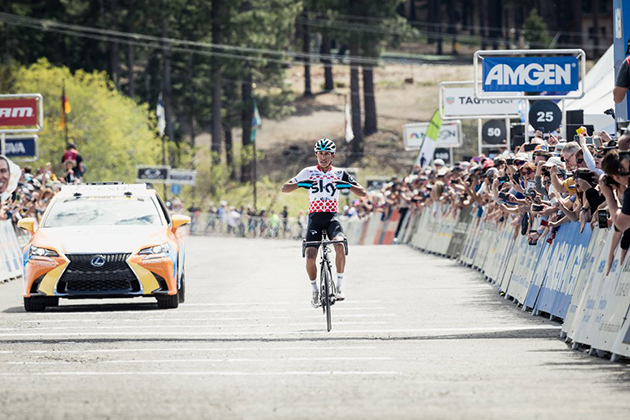 “Second, it is testament to the staff and other riders at Team Sky who have helped him develop over the last year. This is his first year as a professional and we have always taken great pride at Team Sky on being a team who can nurture and develop young riders. We all know there is much more to come from Egan. He is a big part of the next generation of Team Sky, an incredible crop of young riders, alongside the likes of Tao Geoghegan Hart, Pavel Sivakov and Gianni Moscon. We are all excited about their unique opportunity to continue to learn from the current generation of great champions – Froome, Thomas and Kwiatkowski - as they support them on the road over the coming years, with the goal of helping them to become champions themselves. 5 October, 2018, Santa Rosa, California (USA): BMC Racing Team will be on the start line of the Presidential Cycling Tour of Turkey next week with a strong and well-rounded rider roster heading to the UCI WorldTour stage race. BMC Racing Team is taking a versatile line-up to the six-day race, Sports Director Klaas Lodewyck said. "I think we are heading to the Presidential Cycling Tour of Turkey with a strong and well-balanced team. For those stages that come down to a bunch sprint, Jempy Drucker, who we know can be up there, will be our leader. Then, I think Patrick Bevin is going to come into the race with some strong late-season form and we can look to do something with him on the uphill finish alongside Nicolas Roche. We will have to see how the race situation develops day by day but firstly, we would like to go for a stage win and then see what we can do to make the best result possible on the General Classification," Lodewyck explained. Jempy Drucker (shown winning stage one of the 2017 Tour of Luxembourg) is headed to Turkey. Drucker and Bevin are both looking forward to ending their 2018 season at the Presidential Cycling Tour of Turkey. "I have raced in Turkey a few times in the past and I always enjoyed it so, I am happy to be going back. There are some big chances for me as a few stages should finish in a sprint and I hope to be able to have some nice results. It will also be the last time that I will race for this team so it will definitely be a special race for me," Drucker said. "I am excited to be lining up at the Presidential Cycling Tour of Turkey for my final race of the 2018 season. After a good UCI World Championships campaign, I am looking forward to racing in Turkey for the first time with some great form and a strong team," Bevin added. (BRAIN) — Ten states will start collecting sales tax from out-of-state online retailers starting Monday, Oct. 1. The laws are in response to the South Dakota v. Wayfair case the U.S. Supreme Court decided in June, and they vary state by state. The new laws are in Alabama, Illinois, Indiana, Kentucky, Massachusetts, Minnesota, Michigan, North Dakota, Washington and Wisconsin. Connecticut and Iowa have passed laws that go into effect soon. Thirty-two states have now passed statutes or regulations to require sales tax collection by remote sellers, according to Internet Retailer magazine. Congress also is considering several bills that would establish a framework for state collection schemes. You can read the entire story here. I think you'll find the readers' comments interesting and useful.